Gonzaga has its first on-campus pub. Back in 2011, Gonzaga alum Jim Powers of Williston, North Dakota, returned to his old stomping ground to meet up with a few of his college buddies. Just like old times, they decided to grab a beer at the Bulldog, a bar that sat toward the northeast side of campus. "I hadn't been there in years, so I said, 'Let's go to the Bulldog,'" reflects Powers. The bar had seen some changes since his last visit, but not for the better. What once was their "watering hole," says Powers, had become rundown and dilapidated — except for the blue, red and yellow sign that hung on the outside of the building. Jim remembers walking out of the bar that day saying to his friends, "I always loved that sign. God, I wish I could have that sign." A few months later, Jim got a call that the Bulldog was closing for good after 65 years in business, with the rights to the name and sign up for sale. "They wanted to sell it, so I bought it," says Powers. "I didn't know what I was going to do with it, but I knew someday we'd use it." The sign remained in storage while Jim and his brother Tom, also a Gonzaga alum, threw around ideas of opening a restaurant, but never quite decided what exactly they wanted to do with it. Jim got another call. This time, the voice on the other side of the line said that there may be a home for that sign, after all. 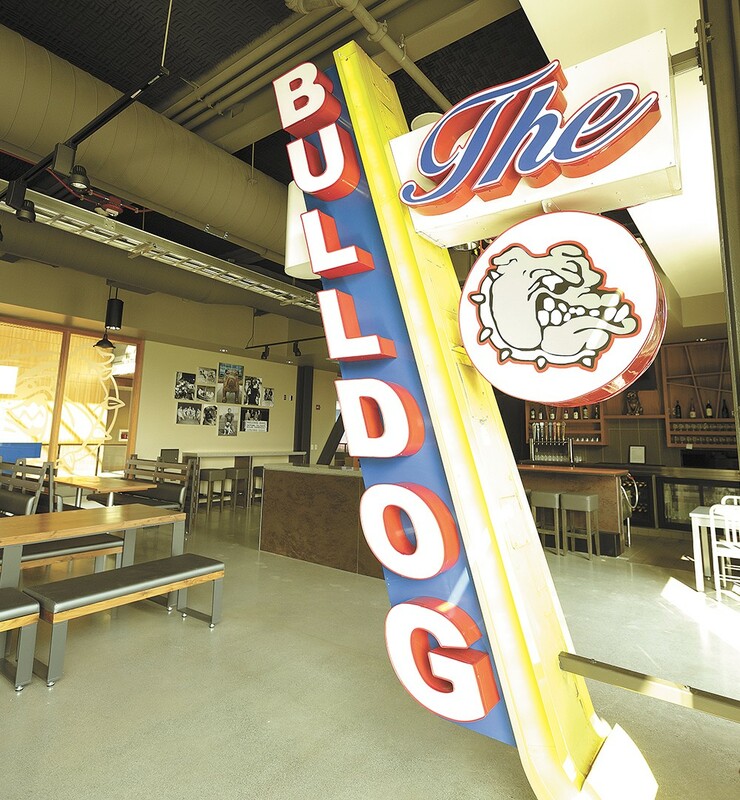 Now you can see Powers' prized possession at the Bulldog Pub inside Gonzaga's new, $51-million John J. Hemmingson Center. The pub, adorned with photographs of the university's real-life mascots from over the year and a row of taps occupied by craft beers, sits on the second floor of the building. Gonzaga has always been a wet campus, allowing students of legal drinking age to enjoy alcohol on school grounds, but there hasn't been a place to buy a drink at the school. Chuck Faulkinberry, the director of the new student center, says he wants to see the space as a place for students and alumni to congregate on game day. "It's not a bar, this is a pub," he adds. "You don't have to be 21. The focus is on food and community, not alcohol." Students will be able to use their meal plans for menu items, aside from alcohol. Alcohol sales will be monitored. Though not set in place, Faulkinberry says there are plans to offer one drink an hour or set a maximum of three drinks per visit. At the least, students will only be allowed to have one drink in front of them at a time. Faulkinberry says that, since the focus is on food, spirits will be not be on display, but can be ordered in mixed drinks. Shots will not be offered. One of the main themes of the pub is locality. Faulkinberry says that the goal is to offer beers and wines made here in Spokane or within the region. Even menu items, like the Bulldog Burger, will be made using local products. Every aspect of the burger will be local: from the beef to the lettuce, which will be grown in the student center's hydroponic garden.